Situated on Maui’s southwestern coastline along Mokapu Beach, the 15-acre beachfront Andaz Maui at Wailea Resort features 301 guestrooms and suites, including 11 luxurious two- to four-bedroom residential villas; cascading infinity pools; a 14,000 square foot full-service spa with a private adults pool, apothecary, retail and fitness facility; more than 15,000 square feet of meeting and event space; and two highly acclaimed restaurants including Ka’ana Kitchen helmed by Executive Chef Isaac Bancaco and Morimoto Maui by Chef Masaharu Morimoto. Designed by world-renowned architects, Rockwell Group, Andaz Maui at Wailea Resort captures the spirit of today’s Hawaii and is a certified LEED® Silver resort. The award-winning Andaz Maui was recently named among Top 10 Conde Nast Traveler’s 2017 Best Resorts in Hawaii and U.S. News & Works Report’s 2017 Best Hotels. The villas at Andaz Maui at Wailea Resort offer discerning guests a secluded hideaway, just steps from the sands of Mokapu Beach. The 11 residential-style villas are available in two, three and four bedroom configurations. Each villa has a full kitchen with luxury Miele appliances, private spacious lanais and outdoor lounge areas, exclusive plunge pools or hot tub, and Viking barbecue grills. 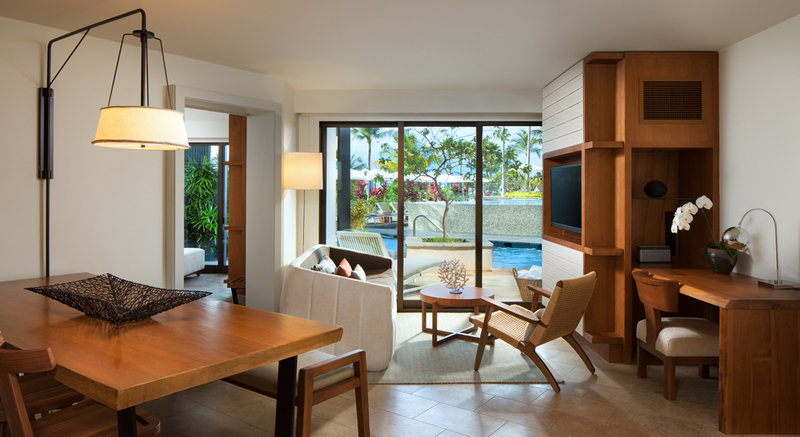 Drawing inspiration from the island’s natural beauty, each villa features white lava stone floors, wooden screens in a white-washed oak, custom furniture and warm walnut finishes throughout to reflect the spirit of Hawaii. Offering partial or full ocean views, villas can be configured as a three-bedroom villa for spacious accommodations or arranged into a one-bedroom villa, perfect for honeymooners, newlyweds or couples celebrating an anniversary or babymoon. Andaz Maui delivers a farm-fresh, seasonal, and sophisticated culinary experience utilizing the unforgettable, rich island flavors of Maui. Serving breakfast and dinner, Ka’ana Kitchen’s unique, residential-style setting offers views of the infinity-edge pool, lagoon and ocean while providing a culinary experience helmed by Executive Chef Isaac Bancaco that reflects the rich heritage of Hawaii. For the ultimate foodie experience Ka’ana Kitchen offers multiple opportunities to inspire your senses, and of course your taste buds. Situated in the heart of Ka’ana Kitchen’s open-air style kitchen, guests can enjoy a six-course customized menu with wine paired by the resort’s expert sommelier. An interactive cocktail experience with a 3-course meal paired with cocktails handcrafted with your favorite spirit. At $95pp, this experience is perfect for the local foodie, or the adventurous traveler visiting the island. An exclusive, one-of-a-kind Maui culinary experience in partnership with Andaz Maui’s partner, Maverick Helicopters, guests will take flight over Maui’s authentic and remote landscape on an immersive Hawaiian culinary experience. Flying along Maui’s North Coast, the intimate group will soar over Maui’s North Shore, taking in breathtaking sea cliffs and cascading waterfalls with aerial shoreline perspectives above Paia, Hookipa, Haiku and beyond, before landing within the Hana rainforest. Once in Hana, the group will learn about the culture, history, land, native vegetation and plants of the area before returning back to the 15-acre beachfront Andaz Maui for an intimate cooking class in the resort’s signature restaurant, Ka’ana Kitchen, utilizing the fresh fruit and produce from their helicopter experience. This experience will launch January 2018 and will be offered once a month, $1200pp, six-person max per class/tour. *Resort Fee does not include taxes and experiences are subject to availability. The 14,000 square-foot full-service `āwili spa and salon features 10 treatment rooms that include private rain showers, floor-to-ceiling ocean views as well as a private tranquility pool, men’s and women’s relaxation and locker rooms complete with sauna, steam room and a heated plunge pool. Additionally, the spa features multiple ocean-facing manicure and pedicure stations and a full-service hair salon. At the heart of the spa is the Apothecary blend bar, which is a unique apothecary-style spin on the traditional Japanese omakase experience. With the help of the spa’s Apothecary Consultants, guests can learn the healing properties and benefits of each oil, tincture and serum as well as fragrances and essential oils to custom blend spa products for treatments or to take home. Among the selection are locally sourced and destination-inspired ingredients such as Kava Kava, plantain, hibiscus, sugar, coffee berry, plumeria and maitake mushroom. Every couple deserves a wedding celebration that truly reflects them. A creative wedding for a creative couple; An artistic wedding for an artistic couple; A chic wedding for a chic couple. Whether your personal style is timeless elegance or contemporary sophistication, let our wedding designers assist you in creating your dream wedding. Our inspiration is you! No two weddings should be alike, allow the Andaz Maui at Wailea Resort to inspire your moment in time. Make your dreams come true with a Maui destination wedding out of a storybook. From an intimate beachfront ceremony to an elegant garden reception under the stars, our beautiful indoor and outdoor spaces ensure an unforgettable experience. Walk down the aisle on Laule’a Event Lawn with views of the Pacific Ocean and West Maui Mountains, or the Nohea Lawn for a romantic ceremony overlooking the infinity pools and ocean. Our professional wedding designers will assist you throughout your journey, from the rehearsal to the ceremony and reception. Inspired by your style and your story, allow us to be the perfect landscape for your I Do! Children of all ages are welcome at Andaz Maui! HUB 808 kids club for all children aged 5-12 years from 9am to 3pm. Inclusions are subject to change without notice. Based upon availability.